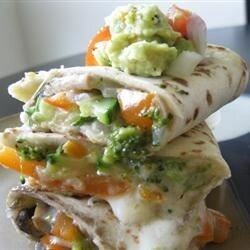 "Delicious quesadillas with cheese and steamed vegetables like broccoli, carrot, bell pepper and mushrooms." Preheat oven to broil. Line a baking sheet with aluminum foil. Place zucchini, broccoli, bell pepper, carrot, onion and mushrooms in a steamer over 1 inch of boiling water, and cover. Cook until tender but still firm, about 2 to 6 minutes. Drain. Place two tortillas, side by side, on the prepared baking sheet. On each tortilla layer cheddar cheese, vegetables, then Monterey jack cheese. Top each with another tortilla. Place under the broiler and cook until lightly browned. Carefully turn tortillas and cook on the other side until lightly browned. Super tasty and super easy Tex Mex! This was OK. I suggest, leave out the carrots because they take longer to cook than the other vegetables, also add garlic salt. I skimped on carrots and broccoli, and still had leftover veggies. Also, I doubled the cheese - found it tastier and better glue to hold the quesadilla together when flipping in the oven.